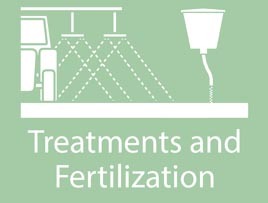 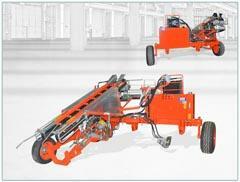 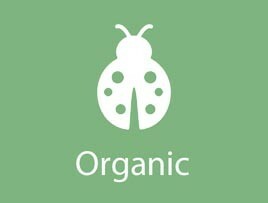 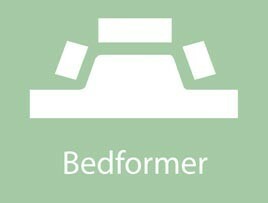 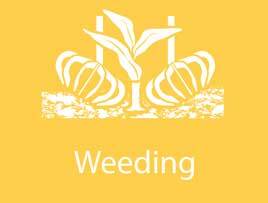 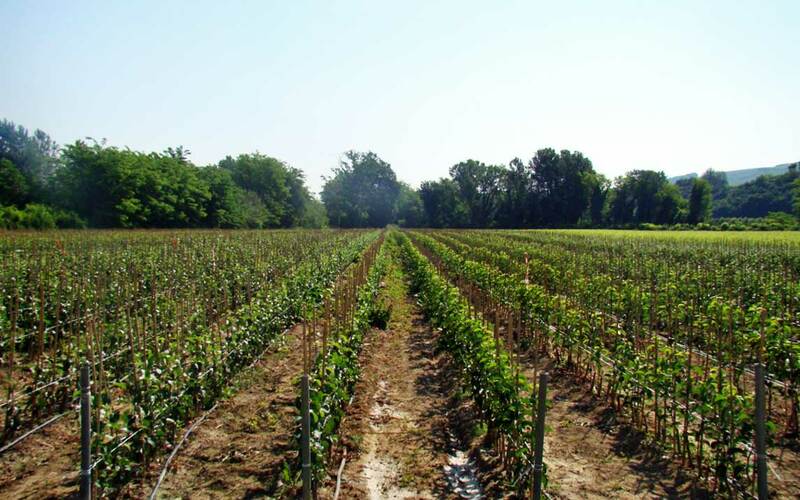 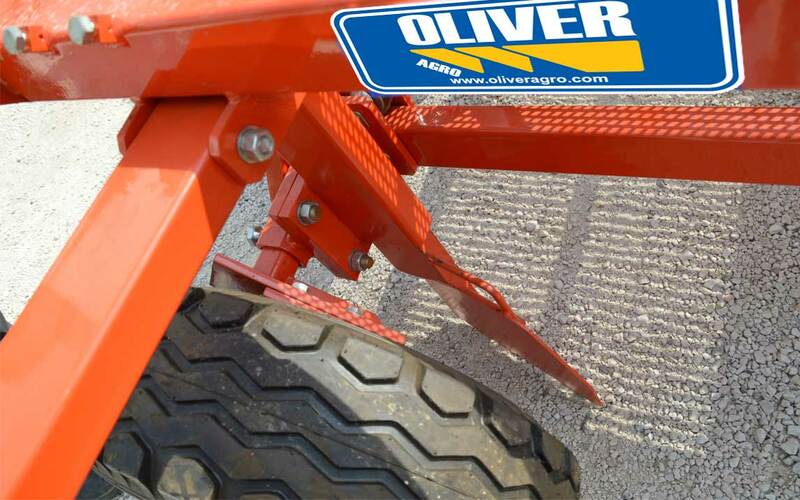 -Performance on any type of soil, particularly hard / heavy / clayey. 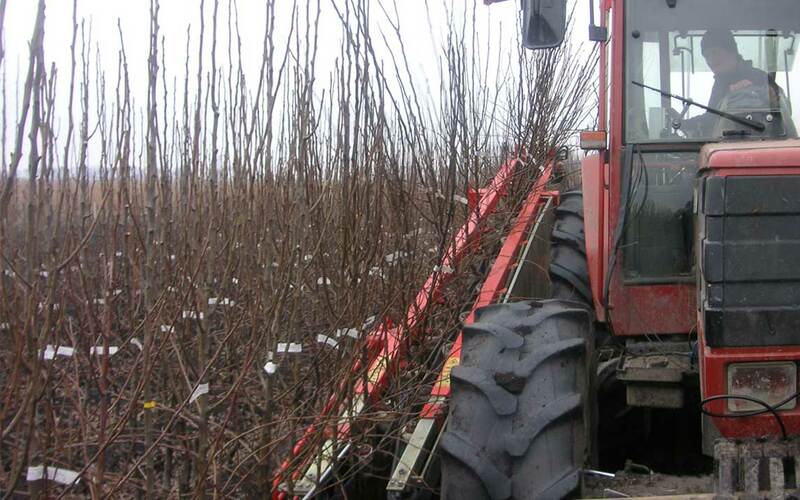 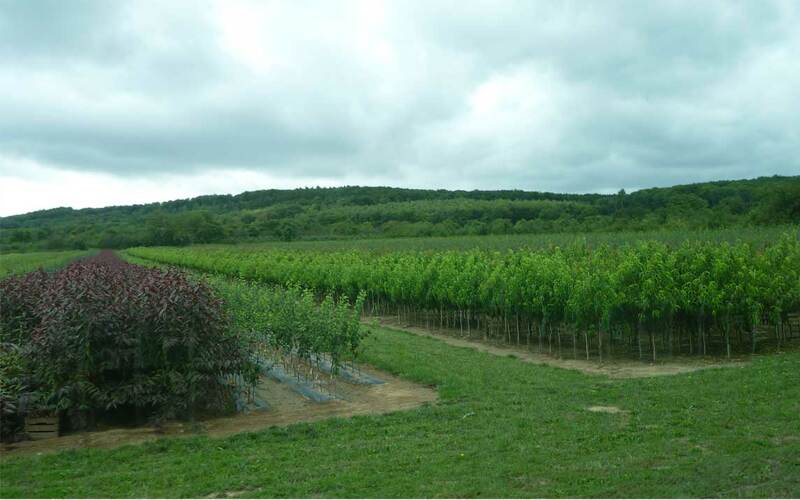 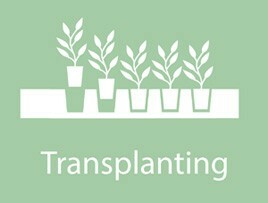 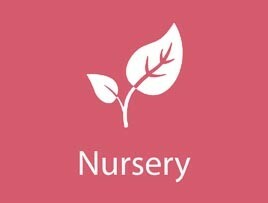 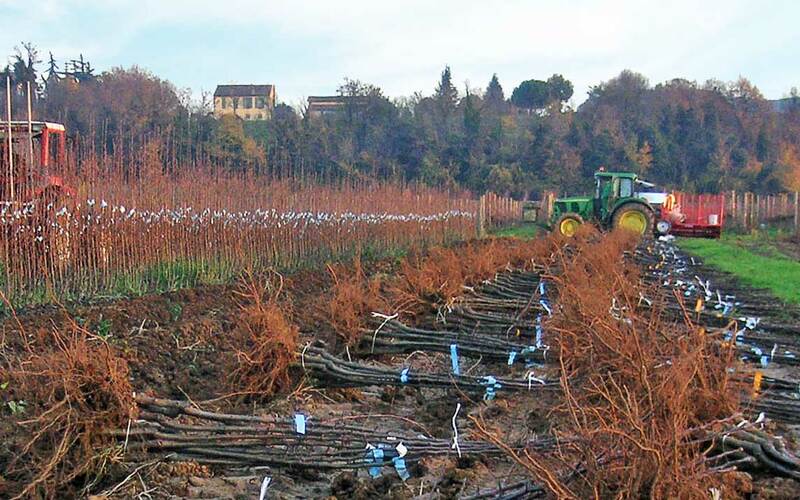 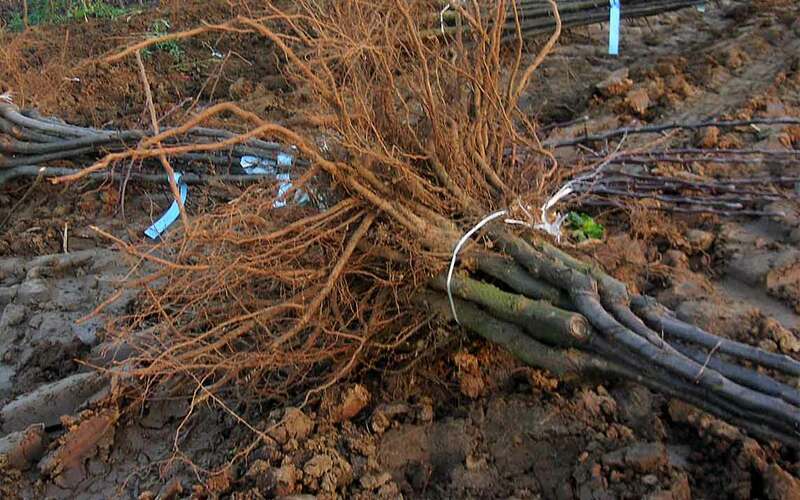 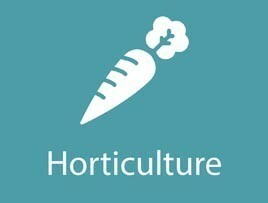 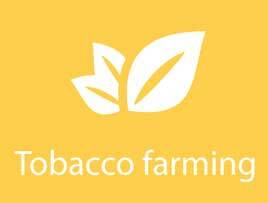 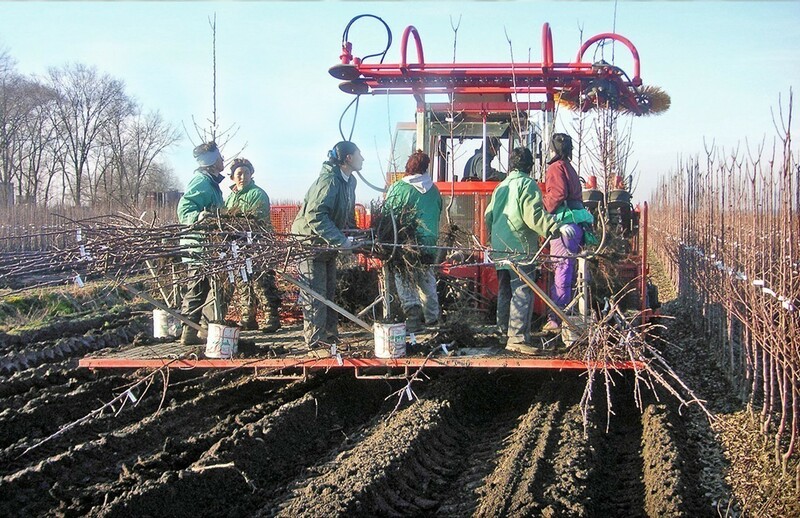 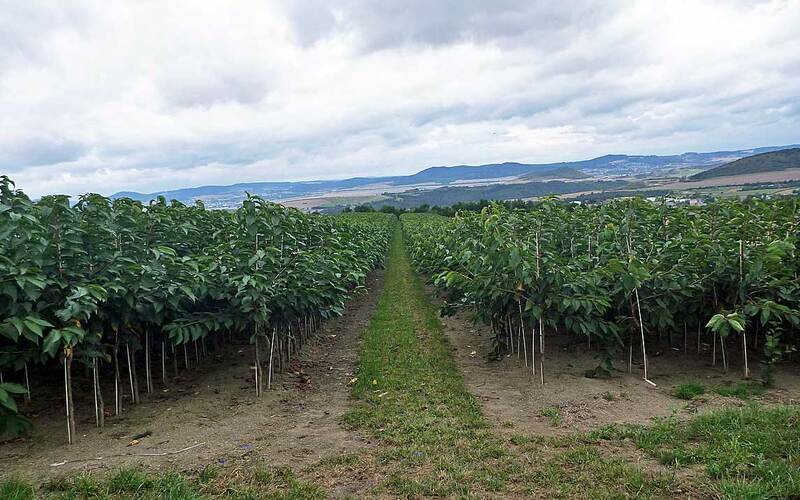 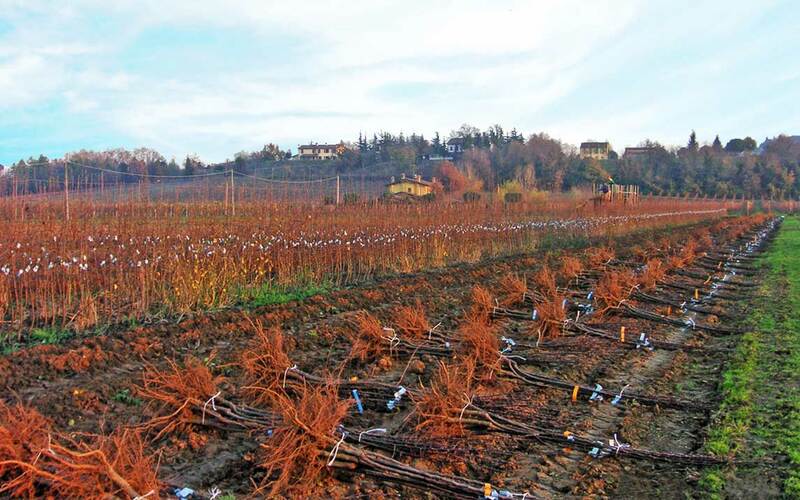 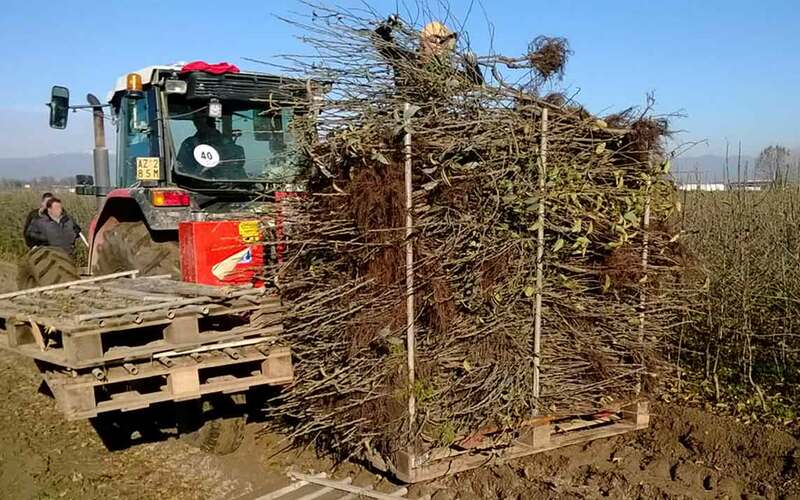 300,000 fruit trees, ornamental and rooted cuttings, with a daily yield of over 20,000 plants harvested and sorted. 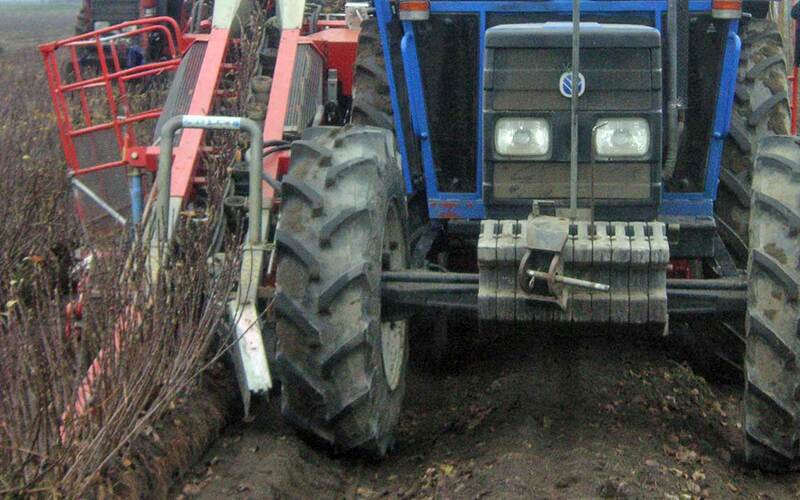 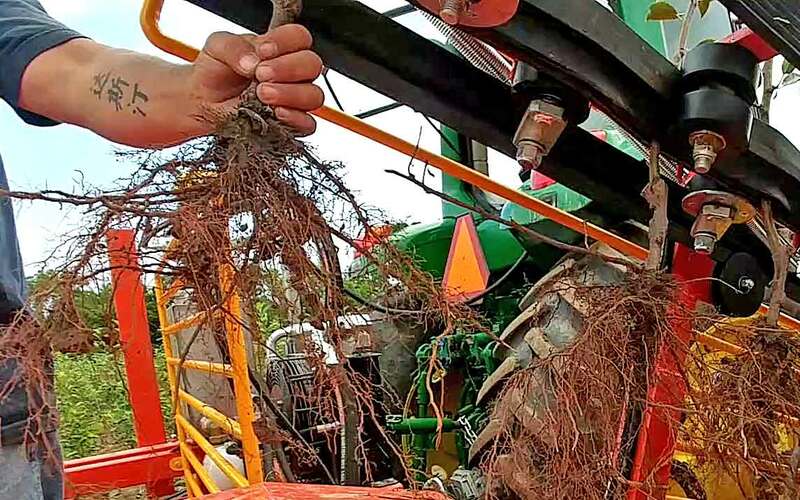 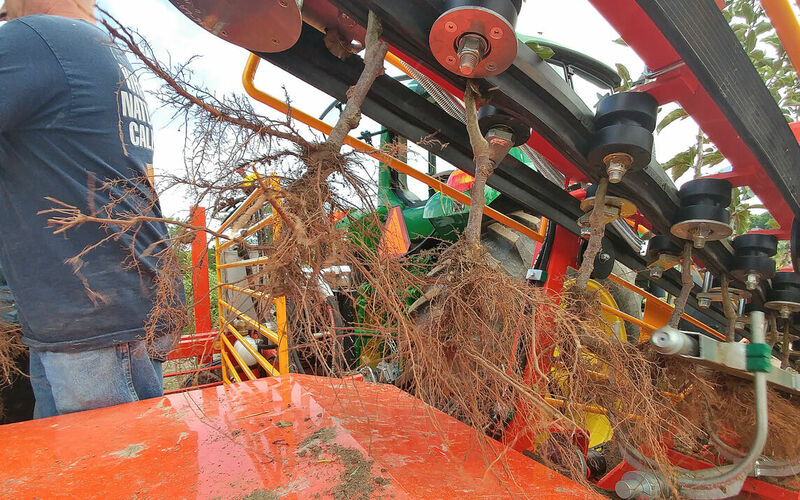 Work on root systems from 30 to 50 cm and above. 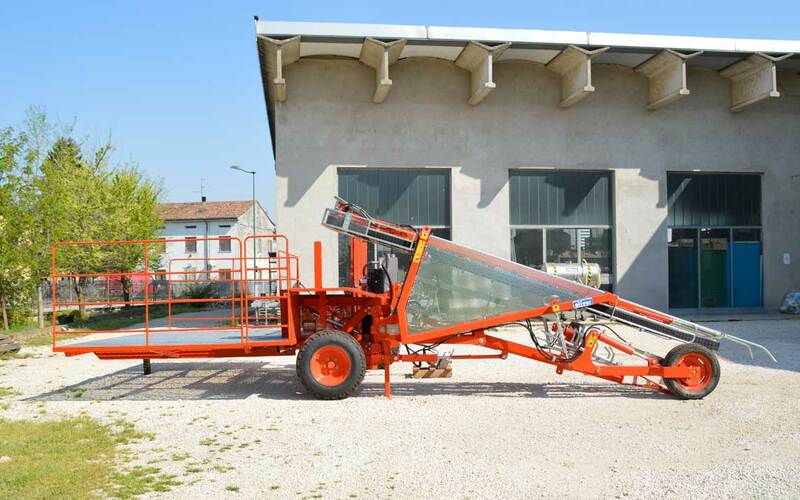 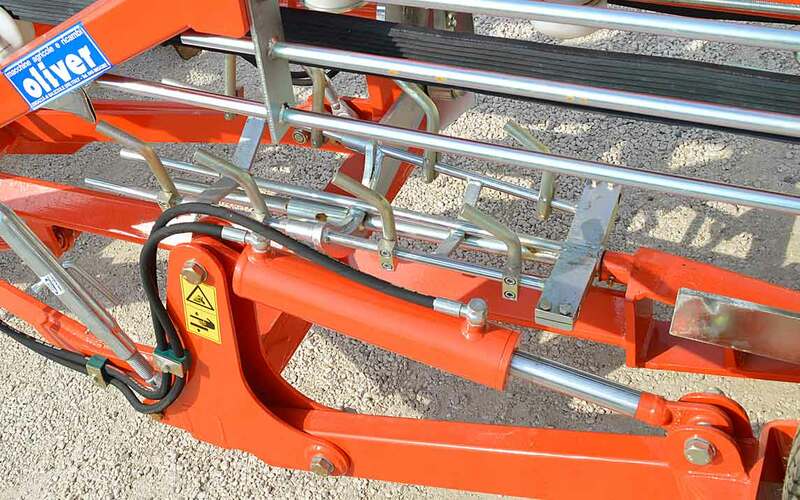 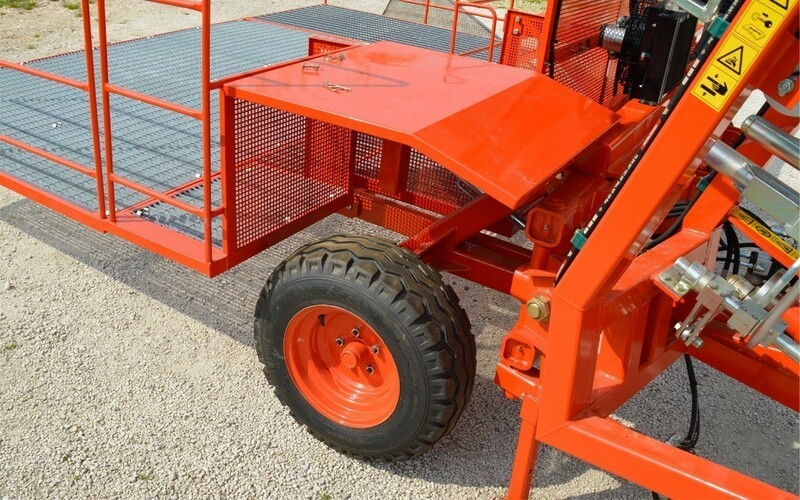 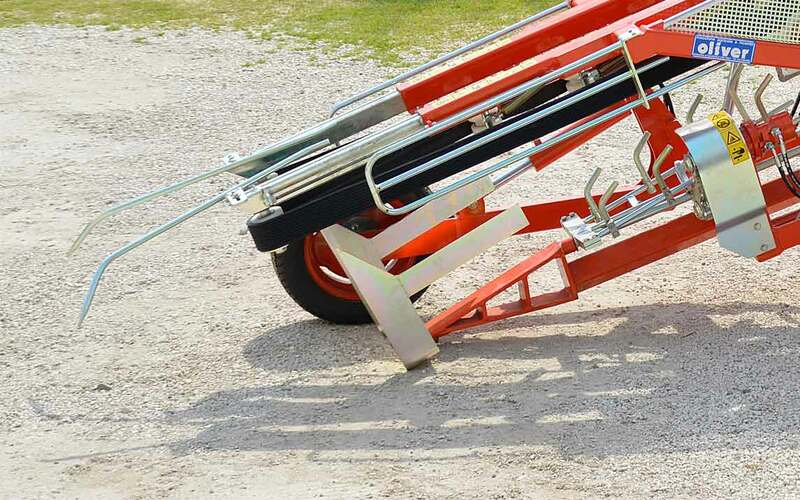 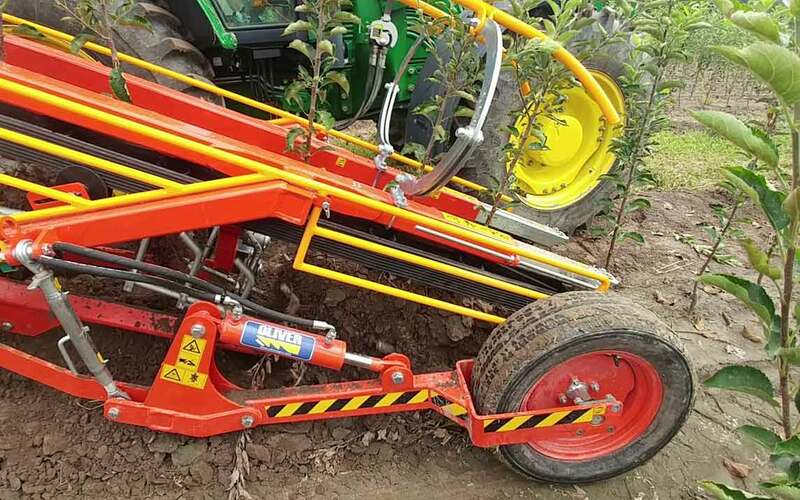 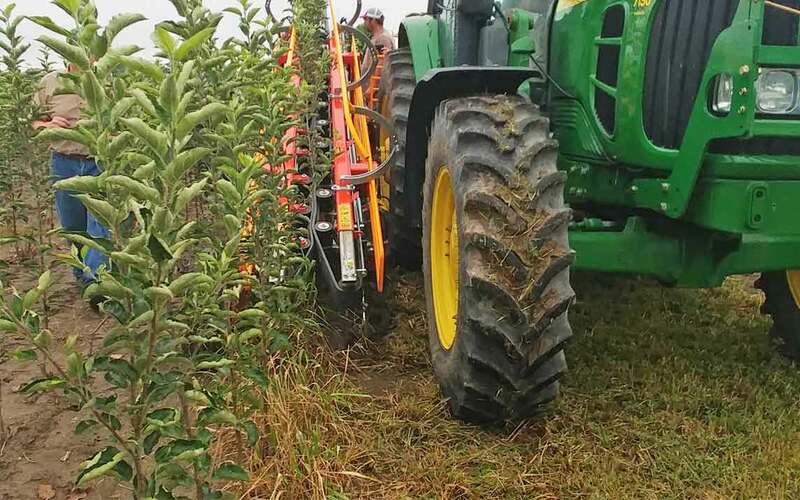 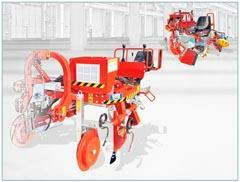 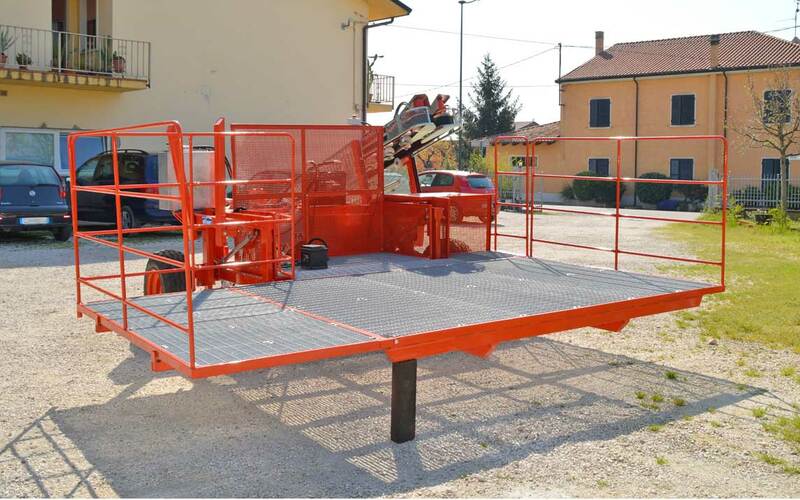 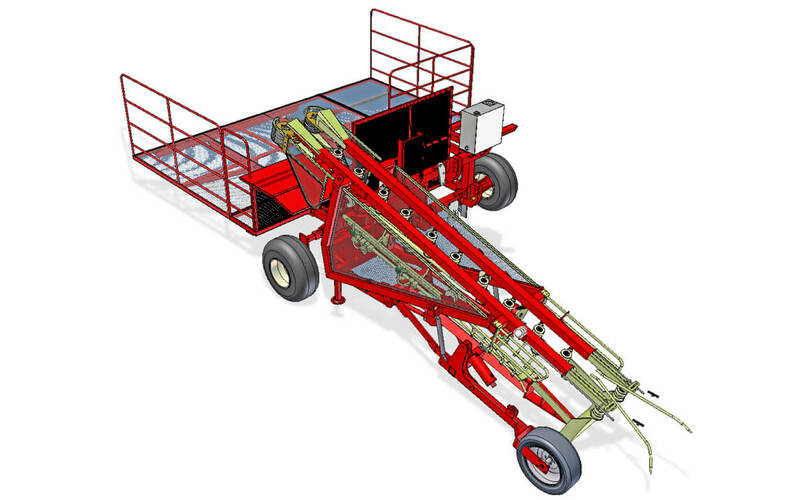 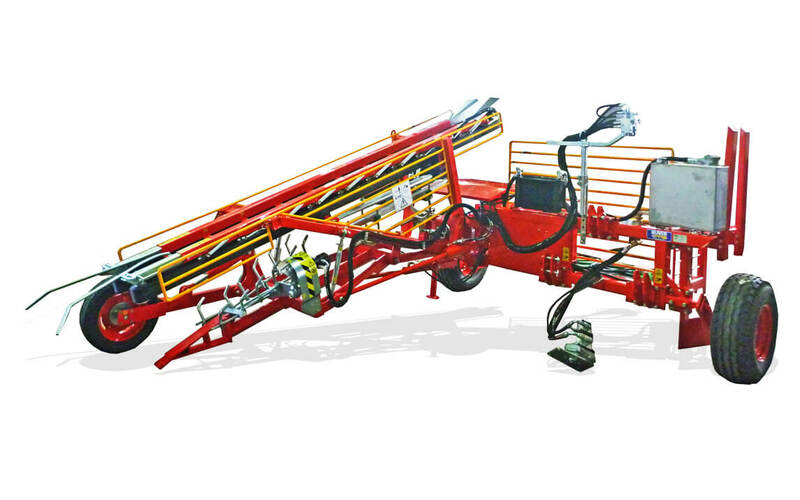 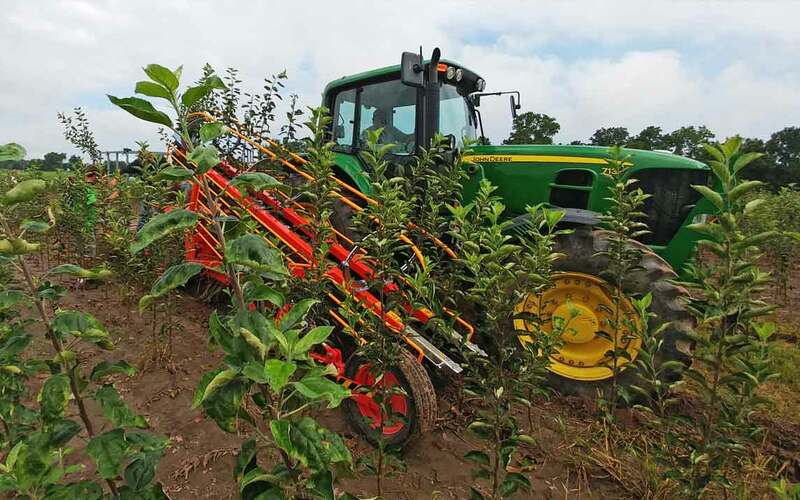 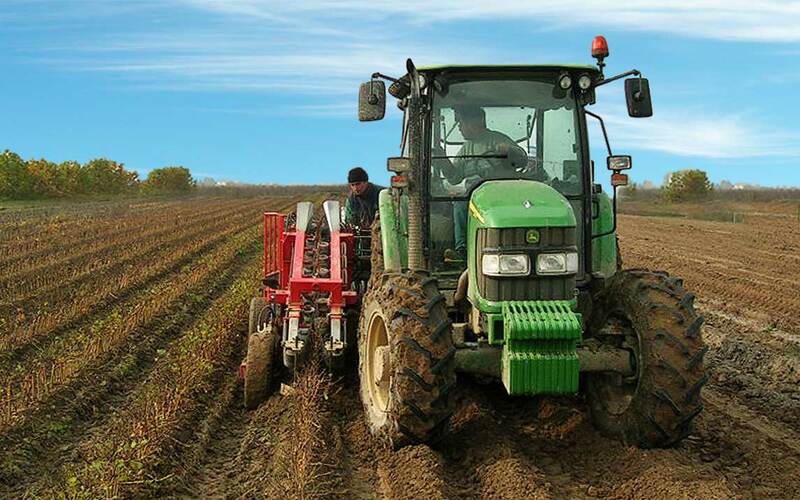 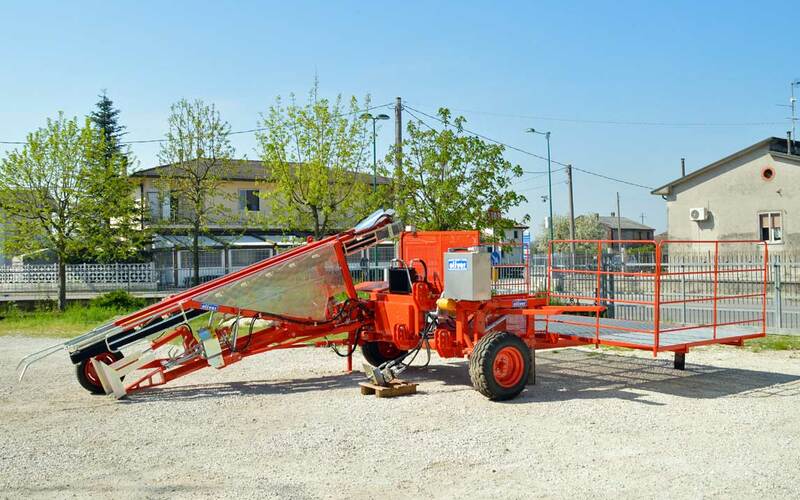 The SP96 Harvesting Machine is a towed machine, consisting of a fixed frame (1), equipped with a third adjustable point (2) for coupling to the tractor. 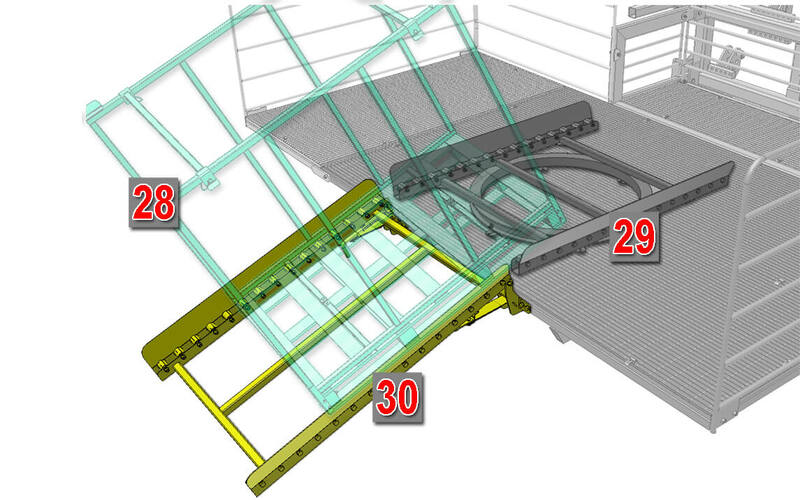 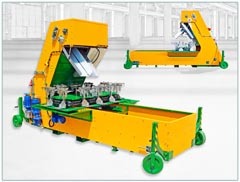 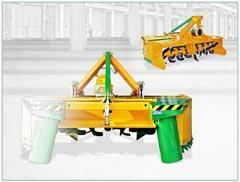 There is a mobile frame (3) which, when transported, allows the machine to be closed by 90 °, reducing its overall dimensions. 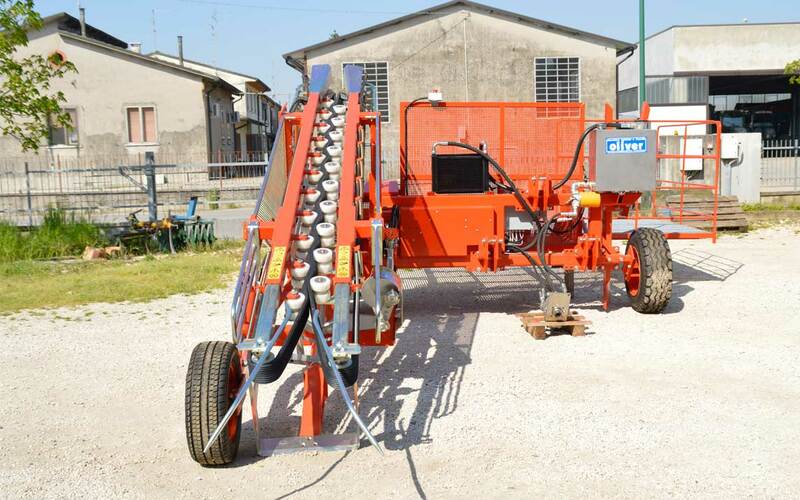 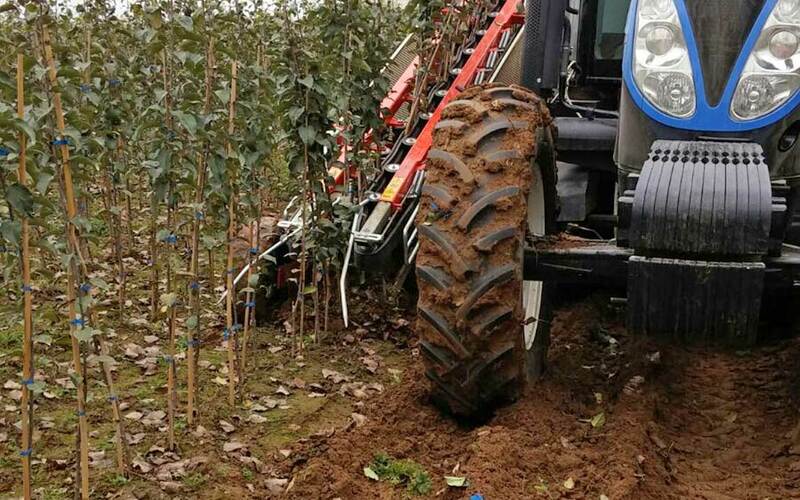 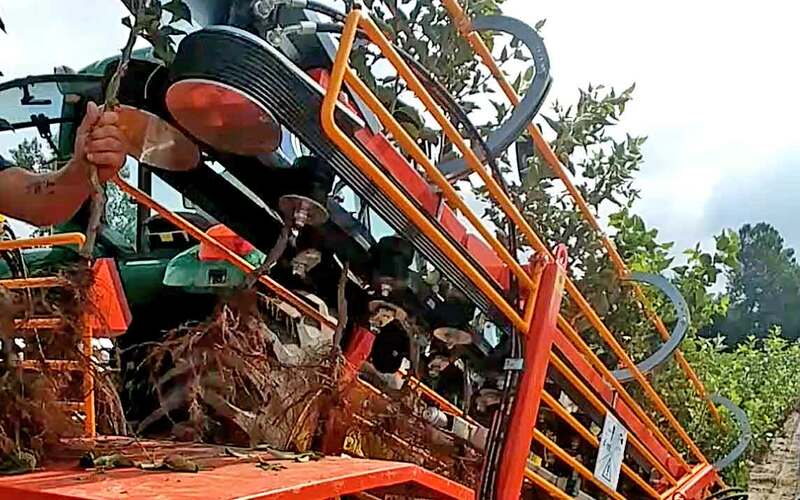 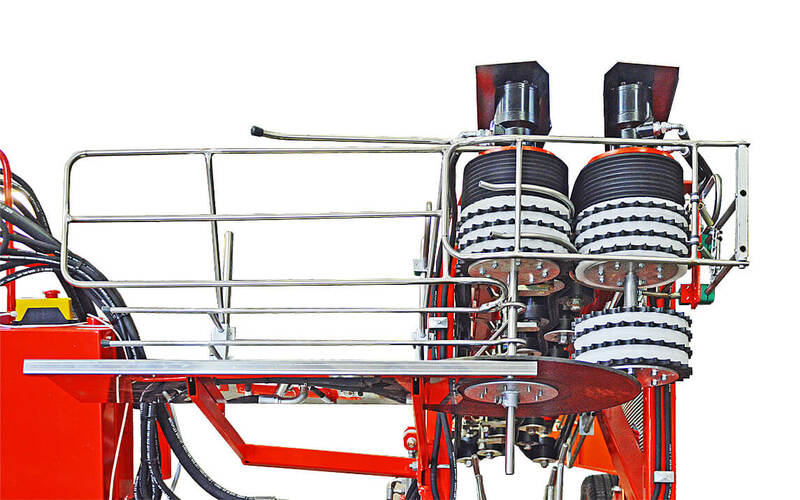 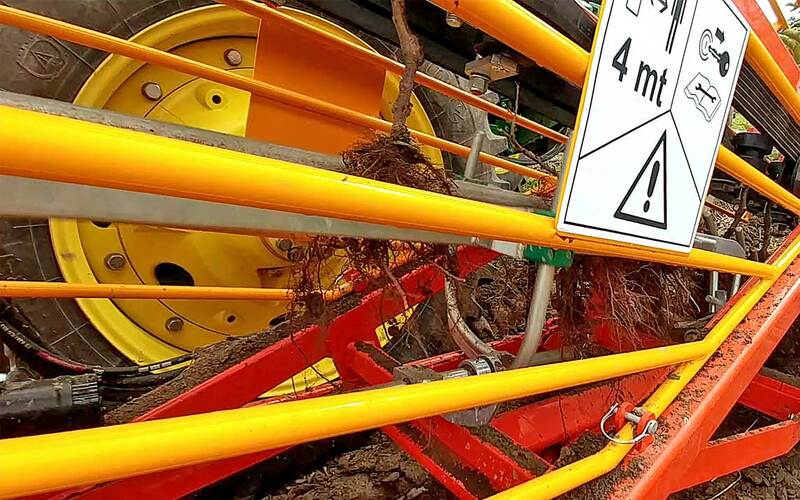 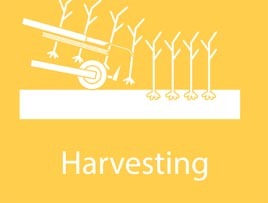 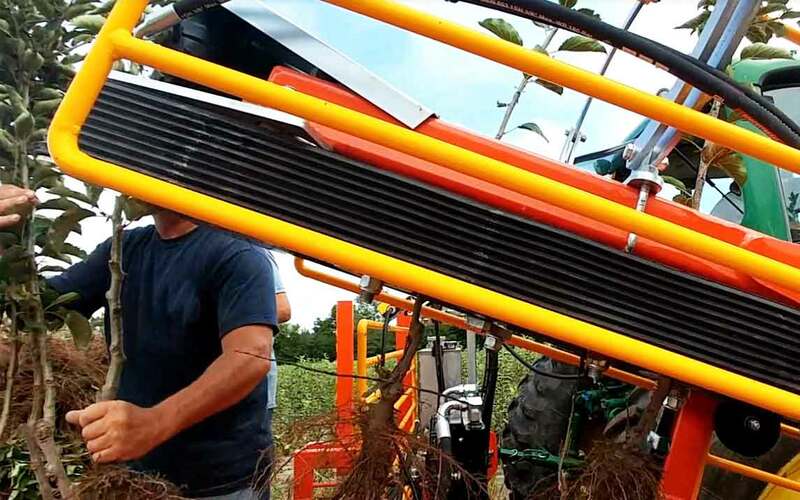 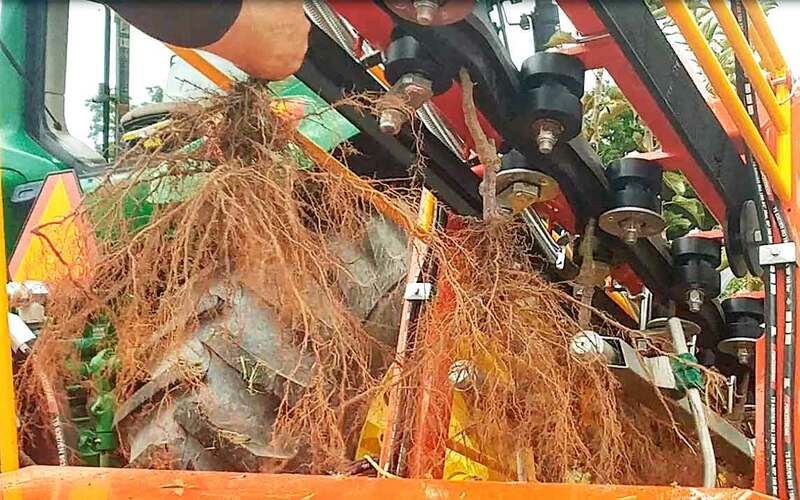 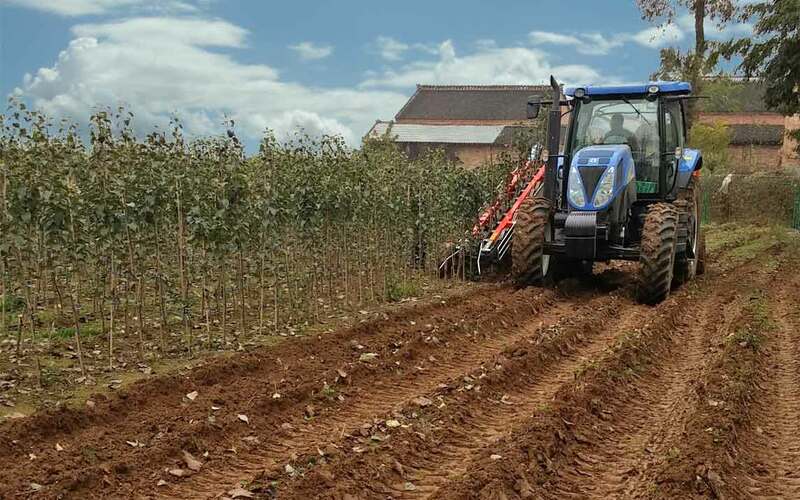 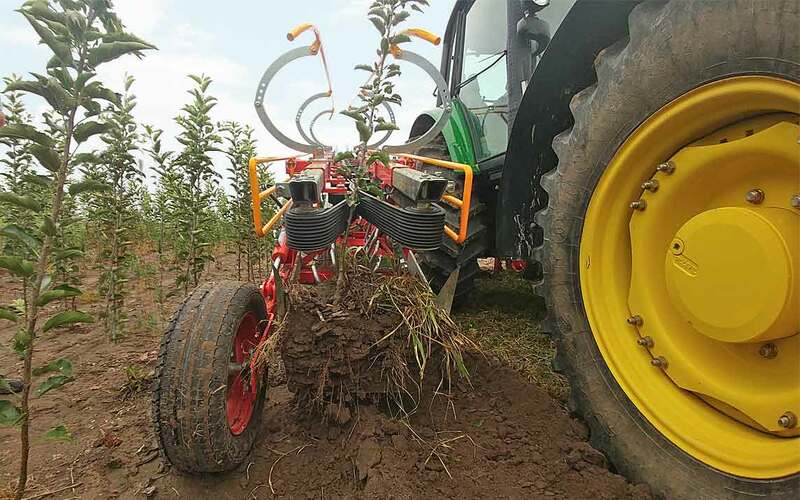 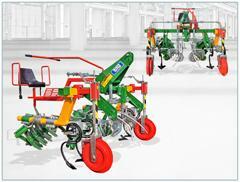 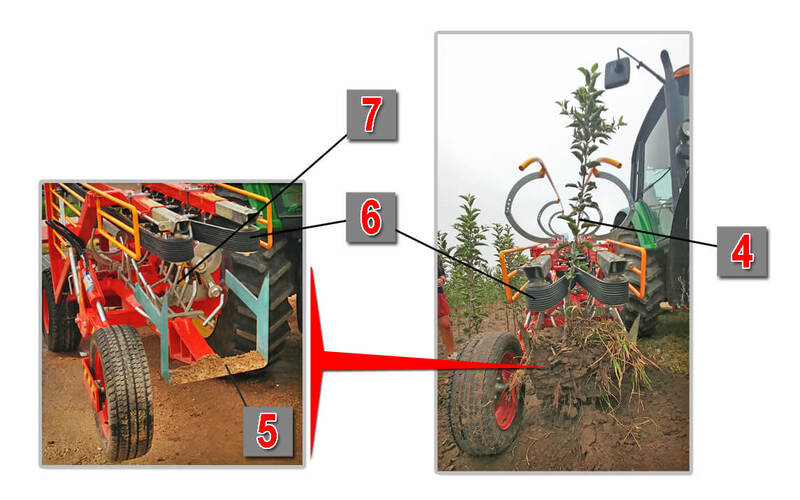 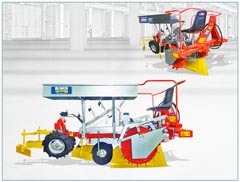 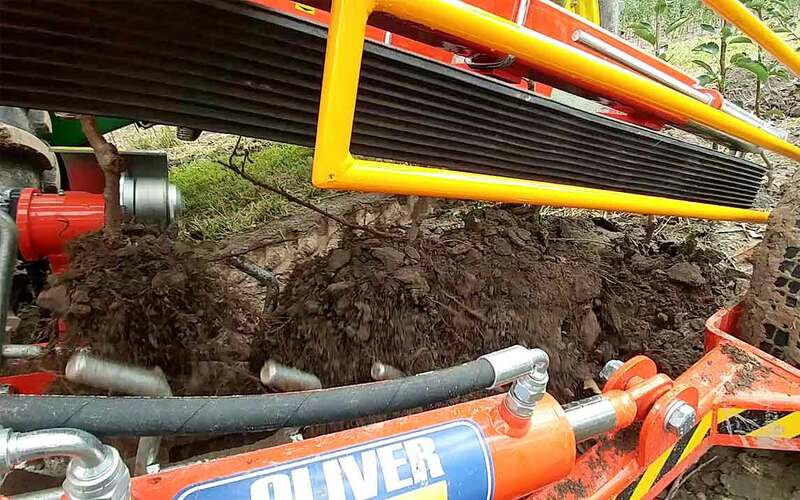 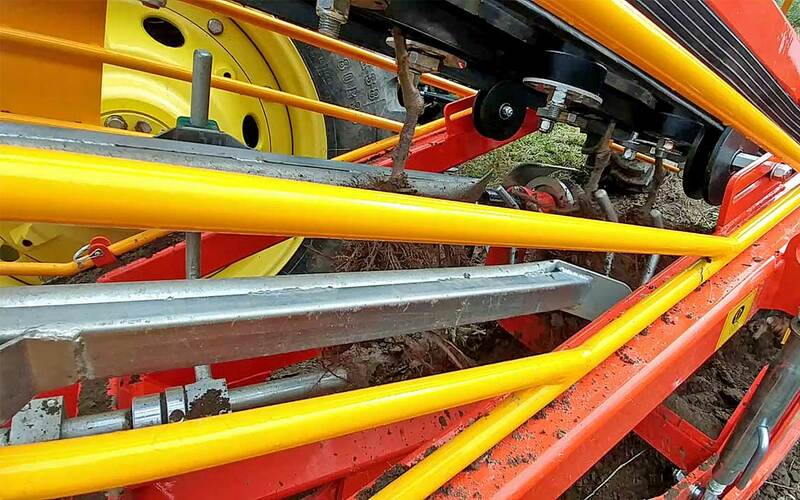 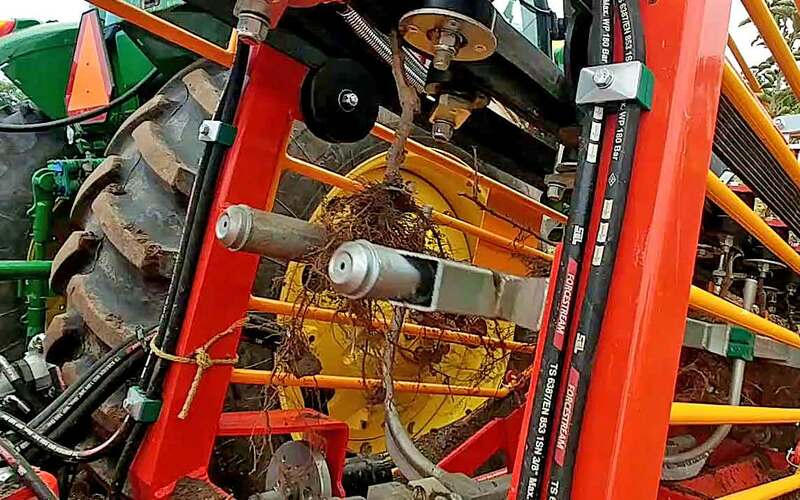 The Harvesting Machine SP96 extracts the plant (4) thanks to the digging knife (5), which penetrates deep into the soil, below the root system, up to 50 cm. 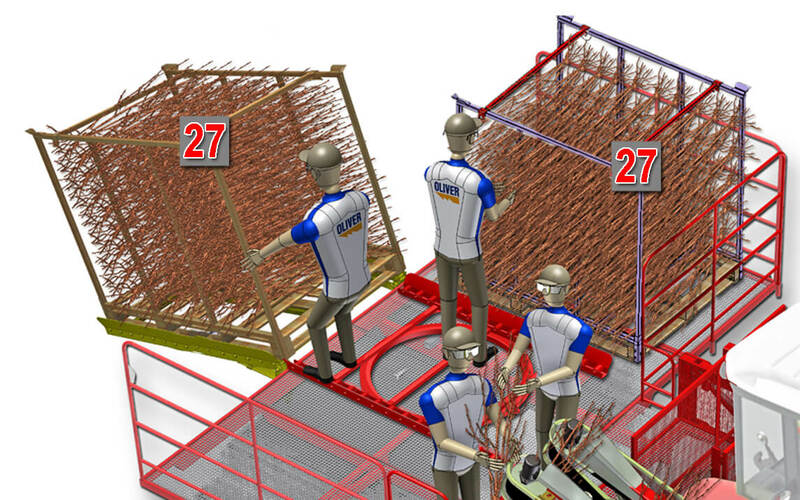 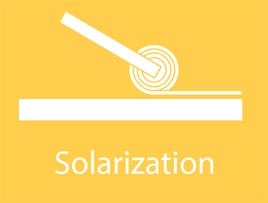 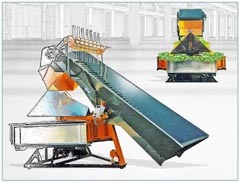 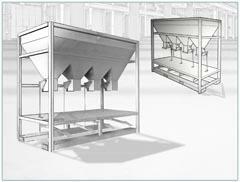 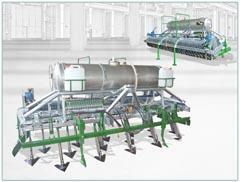 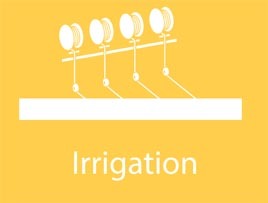 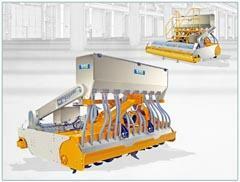 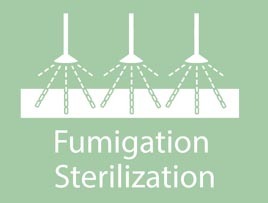 Simultaneously, the conveyor belt (6) conveys the stem of the plant towards the first shaker (7). 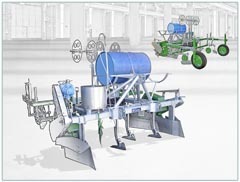 The first shaker (8), alternately oscillating, performs a first skimming of the ground, from the roots of the plant. 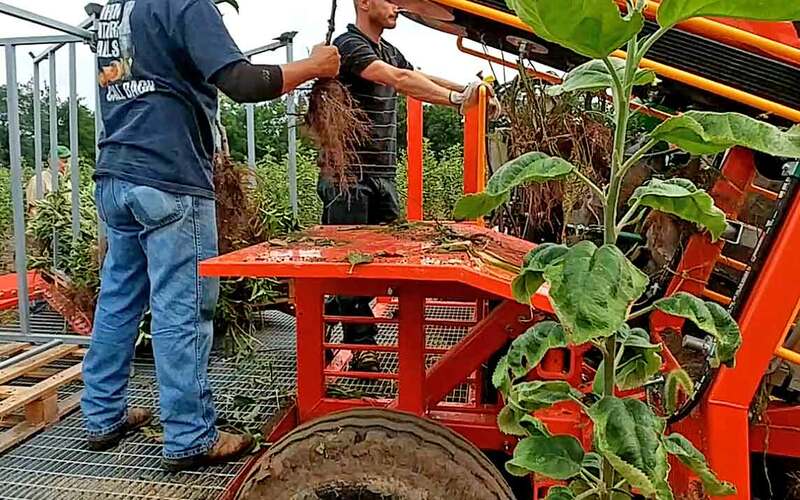 Immediately afterwards, the second shaker (9) completes the skimming work, bringing to light the root system of the plant. 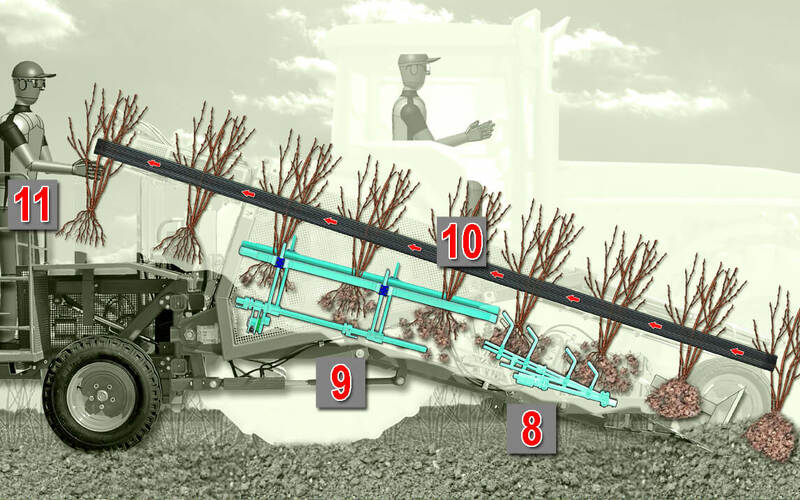 The conveyor belt (10) keeps the plants in position, leading them up to the operator (11) who collects them for sorting. 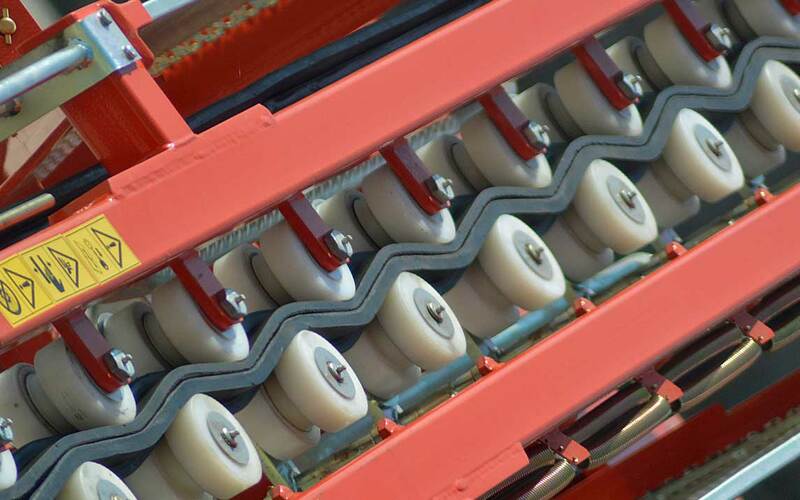 Detail of the first shaker. 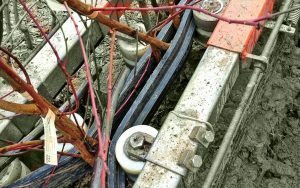 Detail of the second shaker. 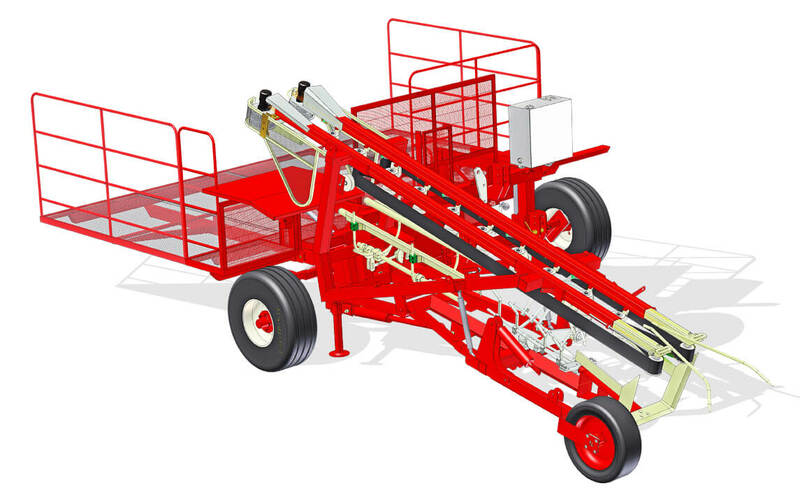 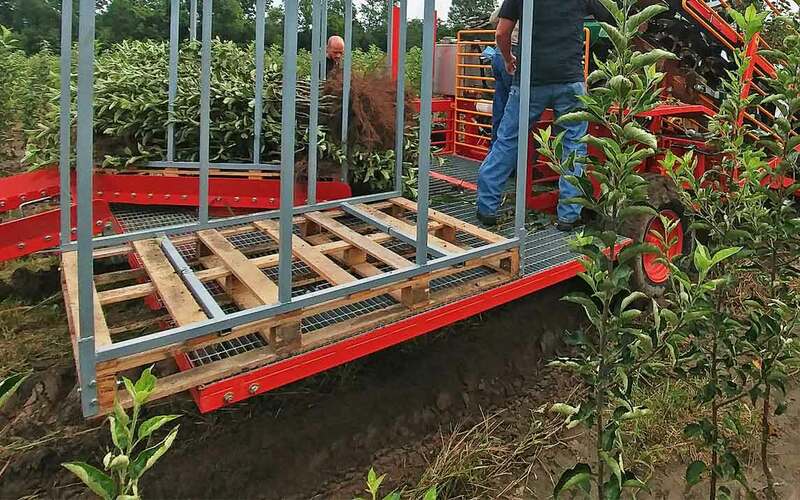 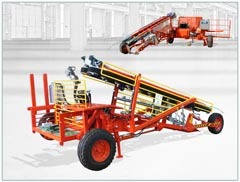 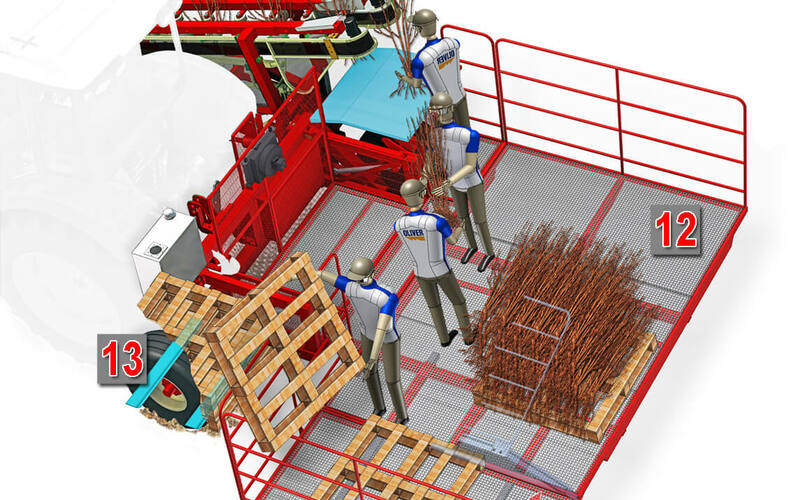 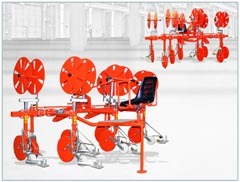 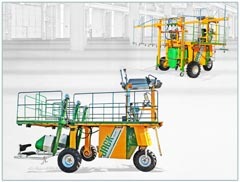 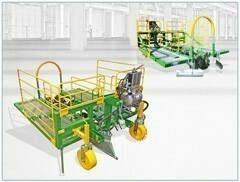 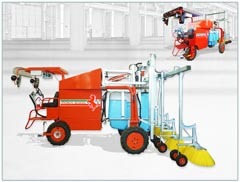 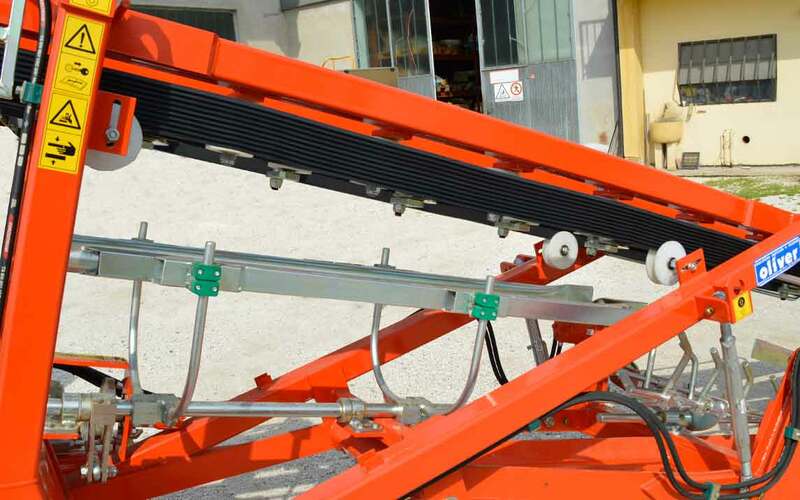 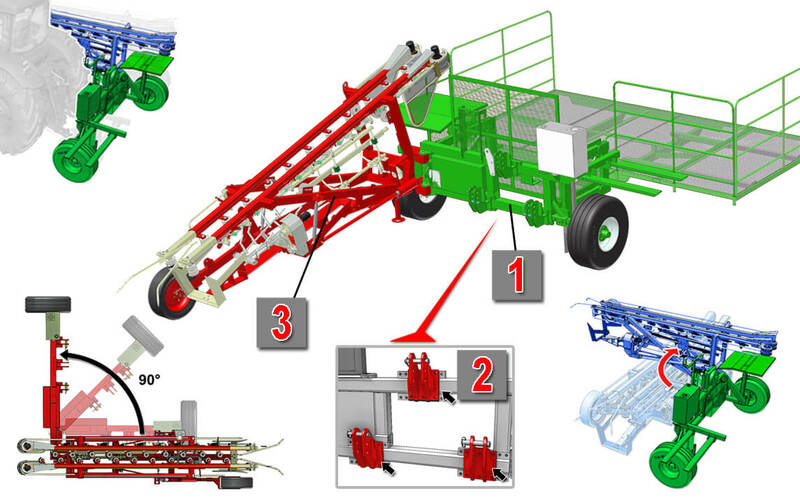 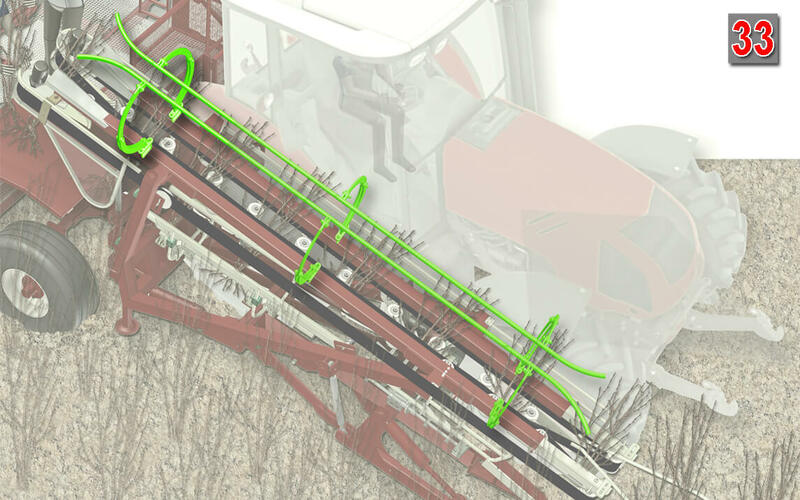 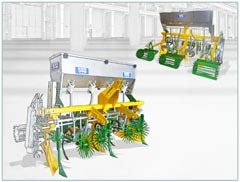 In line, the Harvesting machine SP96 mounts a platform (12) where the operators are placed, which perform the sorting of the plants. 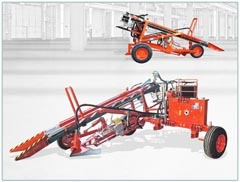 The machine mounts two pallet magazine forks (13), which are used as needed. 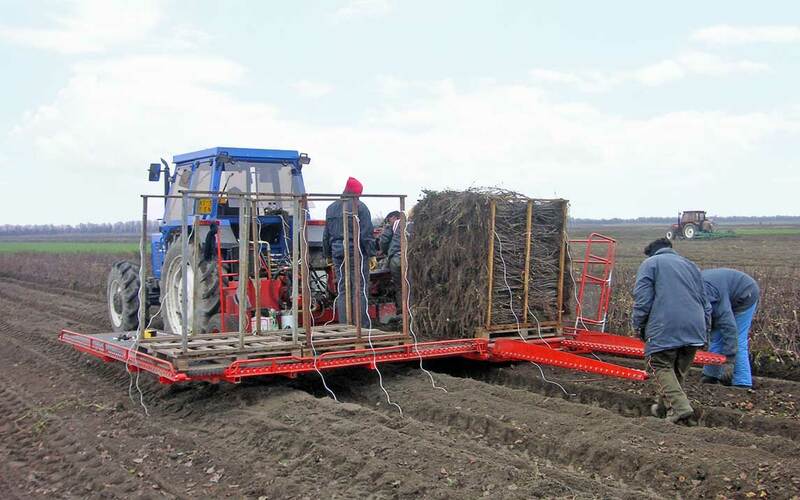 16) tandem pump group that take the motion thanks to the gearbox connected to the tractor. 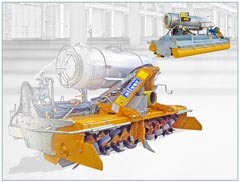 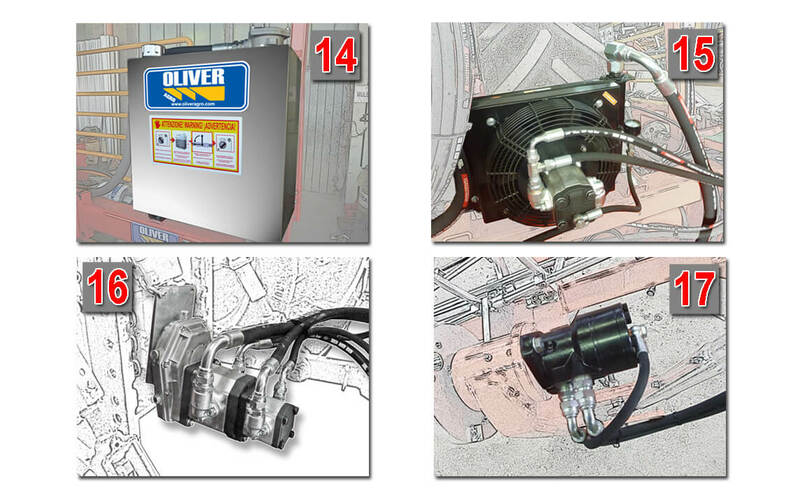 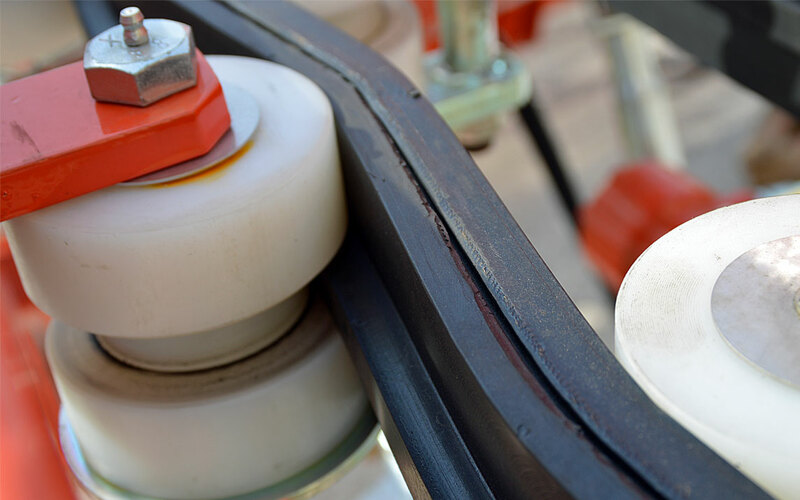 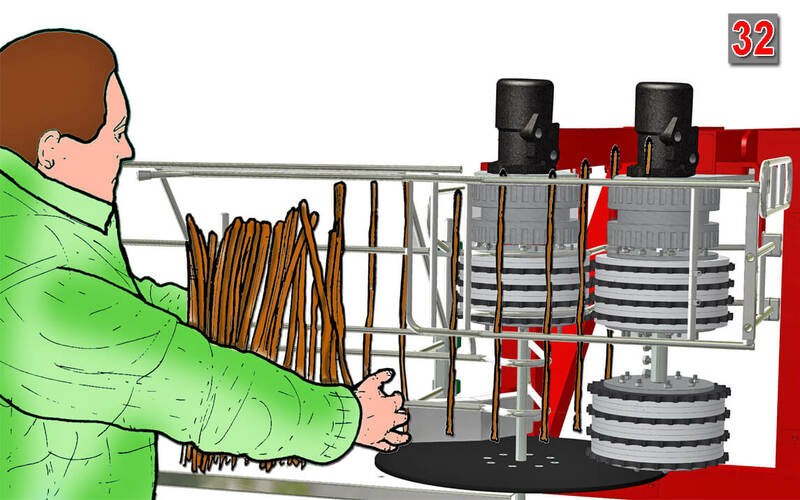 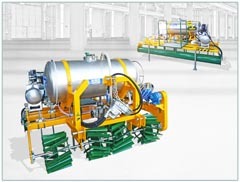 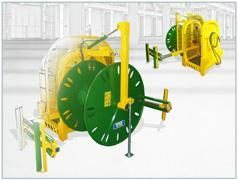 17) hydraulic motors, which move the conveyor belt, the first and the second shaker. 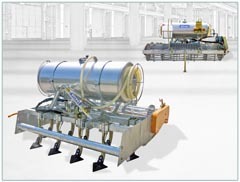 18) speed regulators of the conveyor belt, of the first and of the second shaker. 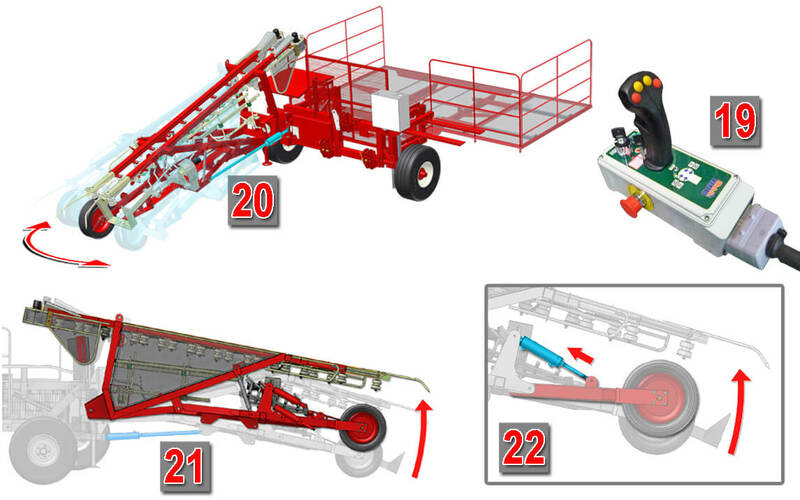 The three hydraulic cylinders are managed with the control console (19). 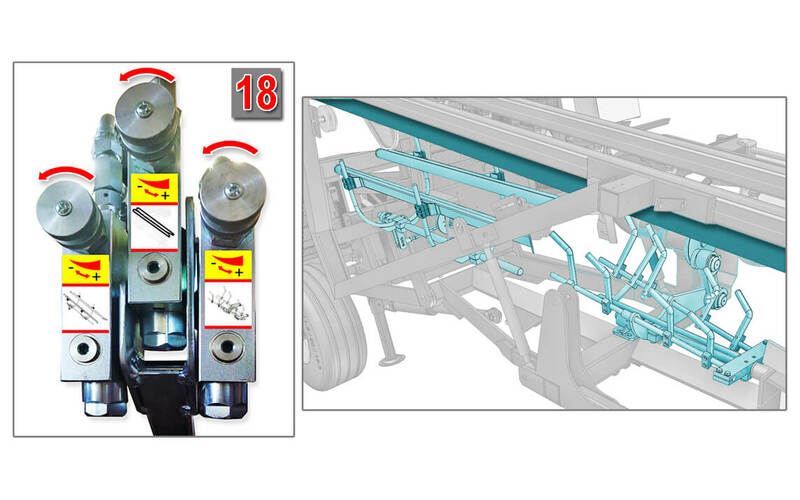 Steering cylinder (20) corrects, and keeps the machine running while working. 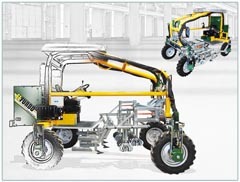 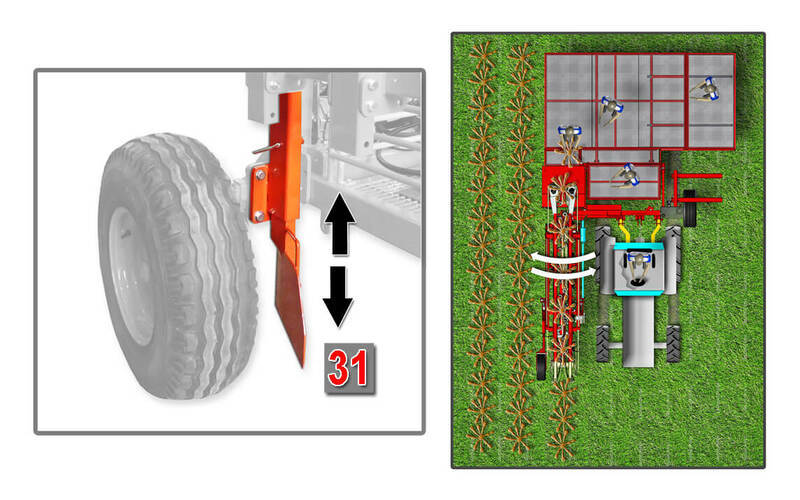 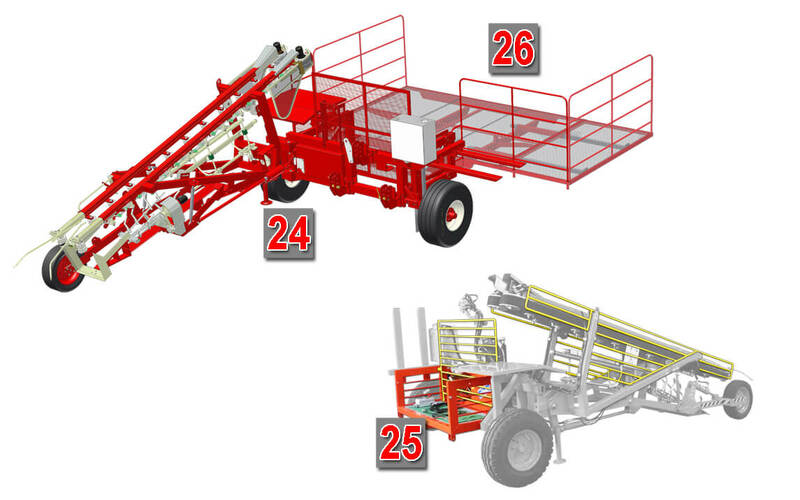 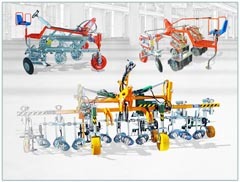 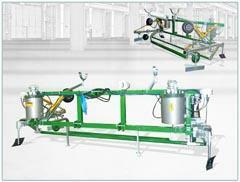 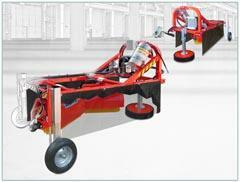 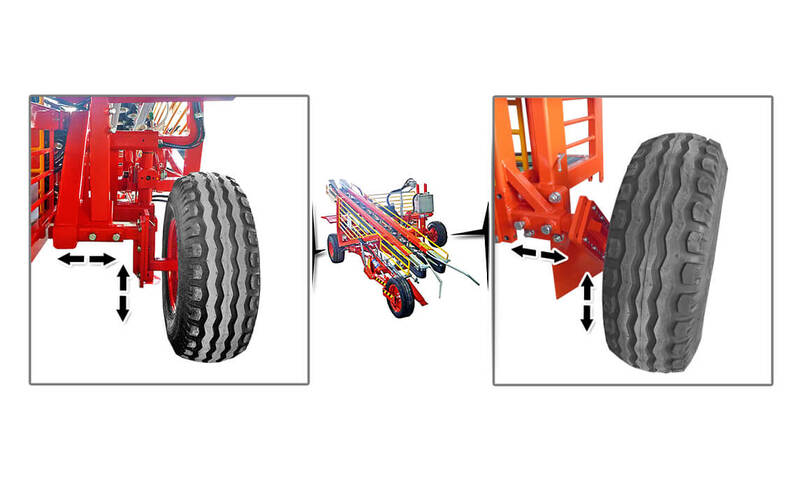 Lift cylinder (21), raises and lowers the mobile frame (22) during work and lifts it during movements. 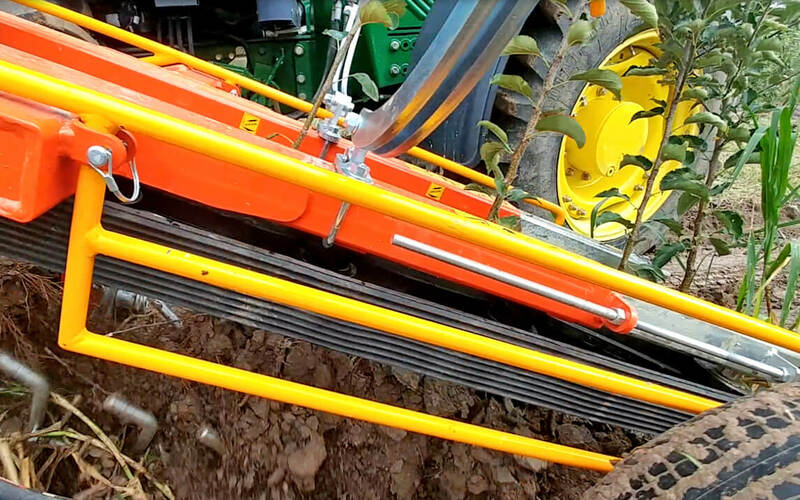 Excavation drill cylinder (23), adjusts the working depth of the digging knife. 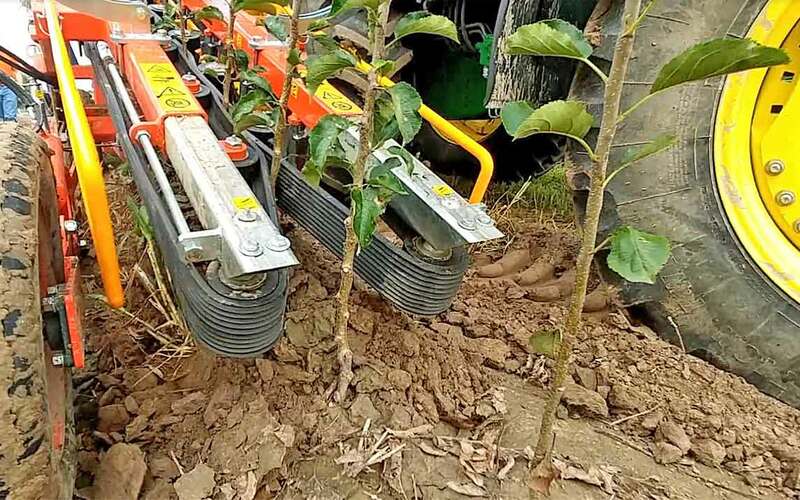 The machine could be, upon request, fitted with a directional knife, equipped with a rudder (31) which, penetrating into the ground (the depth is adjustable), helps to keep it underway during the work phase.